Glossary of Valuentum Terms - Valuentum Securities Inc.
Business Quality Matrix. We compare the firm's ValueCreation and ValueRisk ratings. The box is an easy way for investors to quickly assess the business quality of a company. Firms that generate economic profits with little operating variability score near the top right of the matrix. Cash Flow Generation. Firms' cash flow generation capacity are measured along the scale of STRONG, MEDIUM, and WEAK. A firm with a 3-year historical free cash flow margin (free cash flow divided by sales) greater than 5% receives a STRONG rating, while firms earning less than 1% of sales as free cash flow receive a WEAK rating. Company Description. The description section provides a brief company profile and in the top right corner indicates the investment style that Valuentum assigns to the stock. Nano-cap: Less than $50 million; Micro-cap: Between $50 million and $200 million; Small-cap: Between $200 million and $2 billion; Mid-cap: Between $2 billion and $10 billion; Large-cap: Between $10 billion and $200 billion; Mega-cap: Over $200 billion. Blend: Firm's that we think are undervalued and exhibit high growth prospects (growth in excess of three times the rate of assumed inflation). Value: Firm's that we believe are undervalued, but do not exhibit high growth prospects. Growth: Firms that are not undervalued, in our opinion, but exhibit high growth prospects. Core: Firms that are neither undervalued nor exhibit high growth prospects. Company Vitals. In this section, we list key financial information and the sector and industry that Valuentum assigns to the stock. The P/E-Growth (5-yr), or PEG ratio, divides the current share price by last year's earnings (EPS) and then divides that quotient by our estimate of the firm's 5-year EPS growth rate. The estimated normalized diluted EPS and estimated normalized EBITDA represent the five-year forward average of these measures used in our discounted cash flow model. The P/E on estimated normalized EPS divides the current share price by estimated normalized diluted EPS. The EV/estimated normalized EBITDA considers the current enterprise value of the company and divides it by estimated normalized EBITDA. EV is defined as the firm's market capitalization plus total debt, minority interest, preferred stock less cash and cash equivalents. DCF Valuation. We opine on the firm's valuation based on our DCF process. Firms that are trading with an appropriate discount to our fair value estimate receive an UNDERVALUED rating. 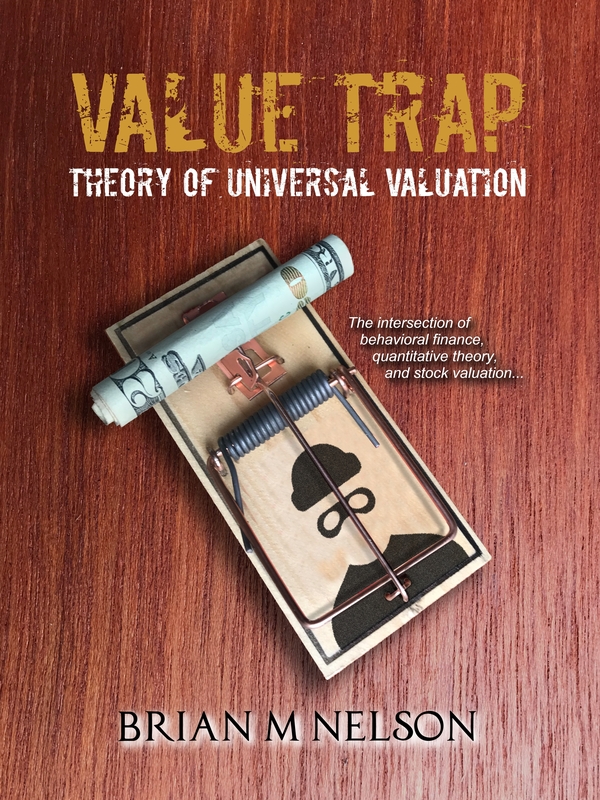 Firms that are trading within our fair value range receive a FAIRLY VALUED rating, while firms that are trading above the upper bound of our fair value range receive an OVERVALUED rating. Dividend Growth Potential. We blend our analysis of a firm's Dividend Safety with its historical Track Record, while also considering historical dividend growth trends. We believe such a combination captures a firm's capacity (cash flow) and willingness (track record) to raise its dividend in the future. Scale: EXCELLENT, GOOD, POOR, VERY POOR. Dividend Safety. We measure the safety of a firm's dividend by adding its net cash to our forecast of its future cash flows and divide that sum by our forecast of its future dividend payments. This process results in a ratio called the Valuentum Dividend Cushion™. Scale: Above 2.75 = EXCELLENT; Between 1.25 and 2.75 = GOOD; Between 0.5 and 1.25 = POOR; Below 0.5 = VERY POOR. Dividend Strength. Our assessment of the firm's dividend strength is expressed in a matrix. If the safety of a firm's dividend is EXCELLENT and its growth prospects are also EXCELLENT, it scores high on our matrix (top right). If the firm's dividend safety and the potential future growth are VERY POOR, it scores lower on our scale (bottom left). Dividend Track Record. We assess each firm's dividend track record based on whether the fundamentals of the firm have ever forced it to cut its dividend. If the firm has ever cut its dividend (within the last 10 years), we view its track record as RISKY. If the firm has maintained and/or raised its dividend each year (over the past 10 years), we view its track record as HEALTHY. Estimated Fair Value. This measure is an output of our DCF valuation model and represents our opinion of the fair equity value per share of the company. If our forecasts prove accurate, which may not always be the case, we may expect a firm's stock price to converge to this value within the next 3 years. Fair Value Range. The fair value range represents an upper bound and lower bound, between which we would consider the firm to be fairly valued. The range considers our estimate of the firm's fair value and the margin of safety suggested by the volatility of key valuation drivers, including revenue, gross margin, earnings before interest, and enterprise free cash flow (the determinants behind our ValueRisk rating). Financial Leverage. Based on the firm's normalized debt-to-EBITDA metric, we rank firms on the following scale: LOW, MEDIUM, and HIGH. Companies with a normalized debt-to-EBITDA ratio below 1.5 receive a LOW score, while those with a measure above 3 receive a HIGH score. Money Flow Index (MFI). The MFI is a technical indicator that measures buying and selling pressure based on both price and volume. Traders typically use this measure to identify potential reversals with overbought and oversold levels. We use a 14-week measure to rank firms along the following scale: EXTREMELY OVERBOUGHT (>90), OVERBOUGHT (80-90), NEUTRAL (20-80), OVERSOLD (10-20), EXTREMELY OVERSOLD (0-10). Range of Potential Outcomes. The firm's margin of safety is shown in the graphic of a normal distribution. We consider a firm to be undervalued if its stock price falls along the green line and overvalued if the stock price falls along the red line. We consider the firm to be fairly valued if its stock price falls along the yellow line. Relative Value. We compare the firm's forward price-to earnings (PE) ratio and its price/earnings-to-growth (PEG) ratio to that of its peers. If both measures fall below the peer median, the firm receives an ATTRACTIVE rating. If both are above the peer median, the firm receives an UNATTRACTIVE rating. Any other combination results in a NEUTRAL rating. Return on Invested Capital. At Valuentum, we place considerable emphasis on return on invested capital (both with and without goodwill). The measure focuses on the return (earnings) the company is generating on its operating assets and is superior to return on equity and return on assets, which can be skewed by a firm's leverage or excess cash balance, respectively. Risk of Capital Loss. We think capital preservation is key for the dividend investor. As such, we evalute the risk of capital loss by assessing the intrinsic value of each firm based on our discounted cash-flow process. If a firm is significantly OVERVALUED, we think the risk of capital loss is HIGH. If a firm is FAIRLY VALUED, we think the risk of capital loss is MEDIUM, and if a firm is UNDERVALUED, we think the risk of capital loss is LOW. Stock Price Relative Strength. We assess the perfomance of the company's stock during the past quarter, 13 weeks, relative to an ETF that mirrors the aggregate performance of constituents of the stock market. Firms are measured along the scale of STRONG, NEUTRAL, and WEAK. Companies that have outperformed the market index by more than 2.5% during this 13-week period receive a STRONG rating, while firms that trailed the market index by more than 2.5% during this 13-week period receive a WEAK rating. Technical Evaluation. We evaluate a firm's near-term and medium-term moving averages and money flow index (MFI) to assign each firm a rating along the following scale: VERY BULLISH, BULLISH, NEUTRAL, BEARISH, and VERY BEARISH. Timeliness Matrix. We compare the company's recent stock performance relative to the market benchmark with our assessment of its valuation. Firms that are experiencing near-term stock price outperformance and are undervalued by our estimate may represent timely buys. Upside/Downside Volume. Heavy volume on up days and lower volume on down days suggests that institutions are heavily participating in a stock's upward advance. We use the trailing 14-week average of upside and downside volume to calculate an informative ratio. We rank each firm's U/D volume ratio along the following scale: BULLISH, IMPROVING, DETERIORATING, and BEARISH. ValueCreation. This is a proprietary Valuentum measure. ValueCreation indicates the firm's historical track record in creating economic value for shareholders, taking the average difference between ROIC (without goodwill) and the firm's estimated WACC during the past three years. The firm's performance is measured along the scale of EXCELLENT, GOOD, POOR, and VERY POOR. Those firms with EXCELLENT ratings have a demonstrated track record of creating economic value, while those that register a VERY POOR mark have been destroying economic value. 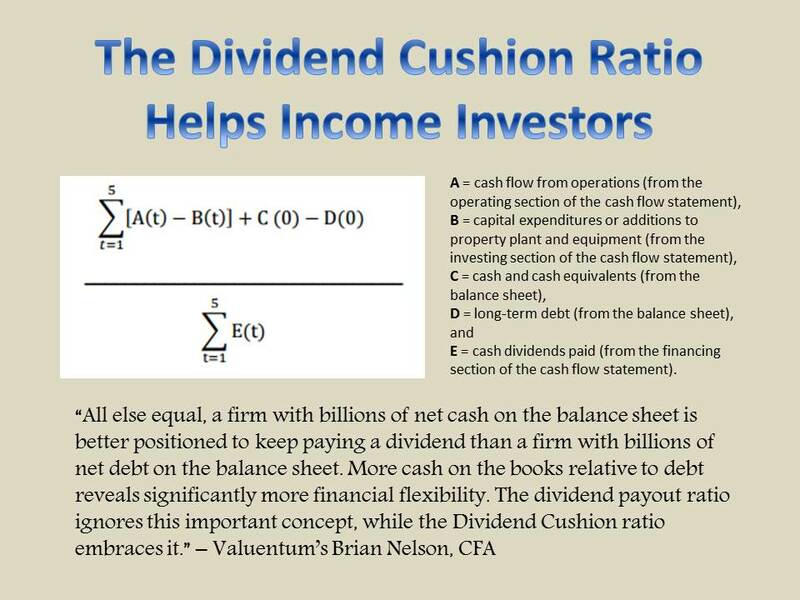 Valuentum Dividend Cushion™. This is a proprietary Valuentum measure that drives our assessment of the firm's Dividend Safety rating. The forward-looking measure assesses dividend coverage via the cash characteristics of the business. ValueRisk. This is a proprietary Valuentum measure. ValueRisk indicates the historical volatility of key valuation drivers, including revenue, gross margin, earnings before interest, and enterprise free cash flow. The standard deviation of each measure is calculated and scaled against last year's measure to arrive at a percentage deviation for each item. These percentage deviations are weighted equally to arrive at the corresponding fair value range for each stock, measured in percentage terms. The firm's performance is measured along the scale of LOW, MEDIUM, HIGH, and VERY HIGH. The ValueRisk™ rating for each firm also determines the fundamental beta of each firm along the following scale: LOW (0.85), MEDIUM (1), HIGH (1.15), VERY HIGH (1.3). ValueTrend. This is a proprietary Valuentum measure. ValueTrend indicates the trajectory of the firm's return on invested capital (ROIC). Firms that earned an ROIC last year that was greater than the 3-year average of the measure earn a POSITIVE rating. Firms that earned an ROIC last year that was less than the 3-year average of the measure earn a NEGATIVE rating.